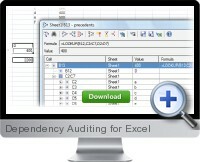 Dependency Auditing for Excel is an add-in for Microsoft Excel. It was designed to trace dependents and precedents recursively within a simple and flexible interface. Dependency Auditing for Excel shows the hierarchical structure of a workbook's logic. All data flows in a workbook can be viewed in one place. It does not cover the worksheet with tracing arrows – all dependencies are shown in separate window in a tree-like form. A branch in tree can simply be expanded to see next level of dependents or precedents. Dependency Auditing for Excel uses advanced techniques to analyze and trace dependencies and evaluate formulas in Excel. It allows to view all data flows in a workbook in one place, and to analyze ripple effects caused by changes in a workbook. The error tracing tool gives the ability to see an entire error chain, and analyze how calculation errors affect other cells. Dependency Auditing for Excel allows easy navigation between dependencies in workbook. Advanced formula evaluation techniques shows all steps of a calculation in a simple and understandable form. Dependency Auditing for Excel is needed to quickly analyze workbook structure and debug calculations of spreadsheet models and applications. All dependencies are shown in simple and understandable form in one place. Easily track all levels of dependents/precedents in a workbook. The workbook is not covered with tracing arrows. References to other sheets and workbooks are shown in same way as other references. All cell’s information – value, formula and name (if exists) is also shown in the same interface.